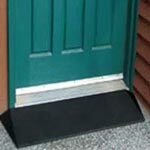 Threshold ramps are designed to allow wheelchair users to more easily pass over the raised threshold of a doorway. 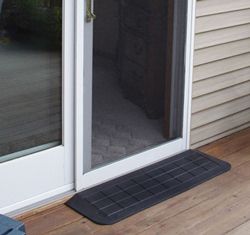 Most doorways have some sort of raised threshold that can be as low as ½ or as high as 4" or more in the cases of some sliding glass doors and can cause a serious impediment to passing through using a wheelchair. Threshold ramps are approximately the same width as an average doorway and come in lengths from 6" to about 30". They can be used as a portable ramps that can be moved from place to place or secured in place for permanent use. When secured to a doorway local building codes may apply and the local building department should be consulted. Most threshold ramps are made of aluminum but there are a few made from recycled vehicle tires on the market as well as some fibre-glass models. 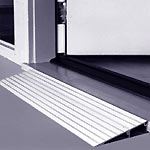 Depending on the manufacturer, the doorway threshold style ramps will have weight capacities of 600 lbs. to 850 lbs. People requiring a threshold ramp will often need two of them because if there is a threshold on the outside of the door it is likely there will also be one on the inside. The two thresholds may also be different heights so it may be necessary to buy two different lengths of threshold ramps. Lengths Available: 6, 9, 12, 17, 22, 27 or 32"
Weights; 3, 5, 6, 8, 10, 15 or 20 lbs. Compatible Equipment: Power & Manual Wheelchairs, Scooters etc. Usage Guideline: Doorways, Curbs, Landings, Thresholds etc. 2 1/2" x 24" x 48"
Weight: 18 or 40 lbs. Usage Guidelines: Standard Doorways, Sliding Doors etc. Weight: 3 to 15 lbs. Lengths Available: 16" or 24"
Weights; 12 or 21 lbs. Compatible Equipment: Power & Manual Wheelchairs, Walkers, Scooters etc. Usage Guideline: Doorways, Low Curbs, Thresholds etc. Width: Various from 42" to 90 1/4"
Lengths Available: Various from 3 1/2" to 23 1/2"
Weights; Various from 2lbs. to 72 lbs. Limits of Use: Up to 2 3/8"